With December fast approaching, I’m delighted to announce that our second issue this year 61/2 is now out and available at Taylor and Francis Online. 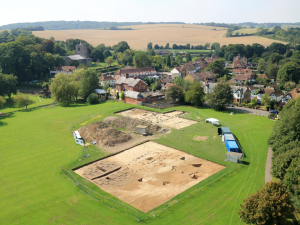 This rounds off 2017 with a range of articles on archaeological findings from across Europe and Britain, as well as Medieval Britain and Ireland PAS round-up, Highlights and Reviews. Hard copies of this issue are winging their way to members now and should arrive in mid-December. 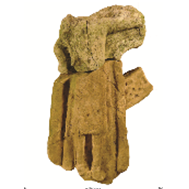 61/2 opens with ‘Interpreting Rock-Cut Grave Cemeteries: The Early Medieval Necropolis of São Gens, Portugal’. Here Stuart Brookes, Catharina Tente and Sara Prata, put forward a new comparative methodology for exploring the form and development of rock-cut cemeteries, which are a well-known class of funerary sites, generally recognised for their paucity of furnishings and dating evidence. These authors point to comparative arrangements and developments on cemeteries in England, and the potential of this information to aid to interpretation in Portugal. Visual Graph Analysis is used in an innovative study of clusters, accessibility, visibility and prominence at the necropolis, producing valuable results and proving that such an approach can draw out further information. In the next article, attention turns to Ireland, in a broad study of jet and jet-like jewellery production in the first millennium AD. Paul Stevens reveals the different scales of indigenous production of these luxury items in early medieval Ireland, and puts forward evidence of the management of materials, manufacture and goods by elites and elite centres, arguing for regional centres of production. Commodities and luxuries are ideas also relevant to the next paper. In ‘Monetary Practices in Early Medieval Western Scandinavia’, Dagfinn Skre argues for a different way of thinking about monetisation, using discussion of evidence drawn from western Norway and Scandinavia in the 5th-10th centuries AD. Skre points to the diverse treatment of metal and bullion as a means of payment in early medieval society and the need to consider its use in customary and symbolic payments. Debate then broadens out in geographic and temporal terms in ‘Religious Transformations in the Middle Ages: Towards a New Archaeological Agenda’. Gabor Thomas and colleagues, present a case-study led assessment of religious transformation in the long term from a cross-cultural perspective. In an examination of pagan, Christian, Islamic and Jewish religions in medieval Europe, the authors move away from national dialogues, instead showing how religious transformation was negotiated by people in terms of tempo and trajectory, and pointing to shared themes of hybridity and resilience. Staying with Christianity the journal moves next to Britain and Lincolnshire in a detailed and exceptionally well-illustrated article, Paul Everson and David Stocker, unfold the complex life of the Louth Cross from Lincolnshire. Starting with the discovery of pre-Conquest cross fragments, they piece together the cross and its life, its use and reuse, in a rich exposition of the development of the market town of Louth promoted by the Bishop of Lindsey in the 10th century. ‘The Cros in the Markitte Stede’ offers new insights on the form and placement of the sculpture, but also the medieval development of Louth itself. The final article takes issue with the long debate in Ireland on medieval ‘hall-houses’. In an innovative study, Karen Dempsey considers and visits numerous ruins and has presents the results of original field survey and geophysics, and argues for a full-scale reconsideration of the form and function of 13th-century Seignurial buildings in Ireland. This issue of course also includes Medieval Britain and Ireland with reports from the Portable Antiquities Scheme and Fieldwork Highlights. PAS features some exceptional finds in 2016, including a 7th-century cabochon-cut garnet gold pendant from Ham and Stone, Gloucestershire: a unique find in this locality. 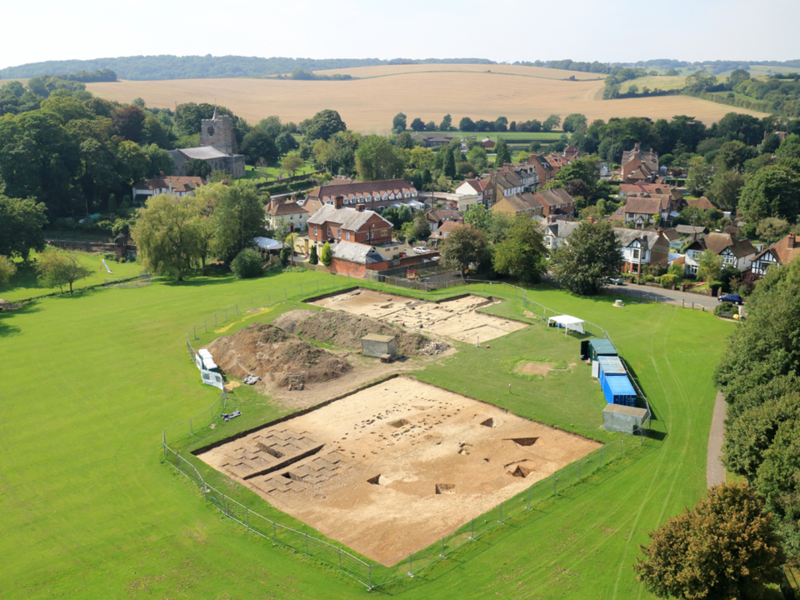 Louth in Lincolnshire is also returned to, with the discovery of an assemblage of finds that may represent the remains of a high-status female burial of the 7th century, including elements of a hanging bowl, a gold-and-garnet pendant, two buckles, a scale pan, and a terminal decorated with a head of Woden. The design on the escutcheons has parallels with examples from Morden (Surrey), and the small hanging bowl from Sutton Hoo Mound 1. Fieldwork Highlights offers insight into the recent excavations and discoveries on the island of Lindisfarne, which may relate to the monastic community and the results of geophysical exploration at Pembroke Castle. Readers can round off the volume by perusing a lengthy reviews section, which encompasses many of the recent publications on sites and conference proceedings from Britain and Europe.